In a striking but unnoticed extension of domestic surveillance, the little-known National Geospatial-Intelligence Agency deployed a U-2 spy plane on the region affected by Hurricane Katrina in 2005 to track hazards to public health. In an article Thursday, Salon's Tim Shorrock explores the emergence of the NGA, born in 1996 from a partnership between the CIA, the Pentagon and the agency that maintains America's spy satellites. The single-seat high-altitude plane, originally designed for CIA spy missions -- remembered perhaps for a 1960 mission where a plane was shot down over the Soveit Union -- is a key element of the US arsenal in collecting intelligence overseas. Its high-resolution imagery is critical for examining nuclear and other weapons sites. In a way, Shorrock suggests the visible mission of the U-2 over New Orleans is akin to the visible mission of the U-2 over the Soviet Union -- a tip of the iceberg in a much larger program that most of America knows nothing about. He notes that Attorney General Alberto Gonzales' recent testimony to the Senate Judiciary Committee for the first time confirmed the existence of various other domestic surveillance programs beyond those first disclosed by the New York Times, similarly intimating the domestic flyovers are more subversive than simply being used for weather catastrophes. "In 2003, the NGA was formally inaugurated as a combat support agency of the Pentagon," he reveals. "It is responsible for supplying overhead imagery and mapping tools to the military, the CIA and other intelligence agencies -- including the National Security Agency, whose wide-reaching, extrajudicial spying inside the United States under the Bush administration has been a heated political issue since first coming to light in the media nearly two years ago." "The NGA's role in Hurricane Katrina has received little attention outside of a few military and space industry publications," he adds. "But the agency's close working relationship with the NSA -- whose powers to spy domestically were just expanded with new legislation from Congress -- raises the distinct possibility that the U.S. government could be doing far more than secretly listening in on phone calls as it targets and tracks individuals inside the United States. With the additional capabilities of the NGA and the use of other cutting-edge technologies, the government could also conceivably be following the movements of those individuals minute by minute, watching a person depart from a mosque in, say, Lodi, Calif., or drive a car from Chicago to Detroit." In 2004, the National Security Agency (which has overseen Bush's warrantless wiretapping program) announced they'd signed an agreement with the NGA to share resources and staff, including their sources, information infrastructure and "exploitation techniques." The document itself is classified, though according to Salon an NGA press release explained "the pact allows 'horizontal integration' between the two agencies, defined as "working together from start to finish, using NGA's 'eyes' and NSA 'ears.'" This collaboration was perhaps most visible when the US bombed a safe house of Abu Musab al-Zarqawi in Iraq. "Eventually, it all comes down to physical location," NGA director Robert Murrett told reporters at the time. When the NSA and NGA pooled resources, he added, "the multiplier effect is dramatic." 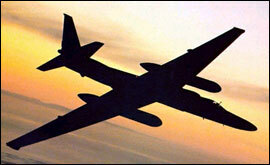 Still, the U-2 isn't designed for tracking individuals, even if the Bush Administration wanted to. Director of GlobalSecurity.org John Pike told Salon, "NGA imagery is not what you would use to track people." But NGA imagery could be combined with that of other surveillance networks. London, for instance, has installed a fleet of spy cameras on city streets, and similar cameras have been deployed in Washington, D.C. and New York, though DC police say they haven't helped fight crime. "U.S. intelligence and law enforcement agencies now have at their disposal facial recognition software that can identify one person among thousands in a large crowd," Shorrock notes. "Combine that with the awesome eavesdropping power of the NSA and the ability of the NGA to capture live imagery from satellites and UAVs, and the result could be an ability to track any individual, in real time, as he or she moves around." Read Salon's full article here.